Ahh Saturday, how I love thee. Yesterday, I relished the chance to sleep in and then lay about in bed relaxing. After getting up at around 9:30, I took a walk and then settled in for breakfast. Plain Greek yogurt with chia seeds, cinnamon and vanilla extract stirred in, topped with a sliced suncrest peach from the farmer’s market. The peach was perfectly ripe and absolutely delicious. Fresh fruit, you’re the best. I was so, so excited for yesterday’s lunch. My absolute favorite pizza in the world is the corn pizza from The Cheeseboard, in Berkeley. I hadn’t had any since last summer, so my mouth was watering as I stood in line. I debated whether I should get one or two slices – here’s where listening to your body is so important. It looked so yummy that I ended up going with two, but told myself I could stop eating whenever I got full. I made sure to eat slowly and savor it, and felt perfectly content and satisfied as I finished. After lunch I headed to a local coffee shop. I sipped iced tea and worked on an exciting upcoming project for the blog! 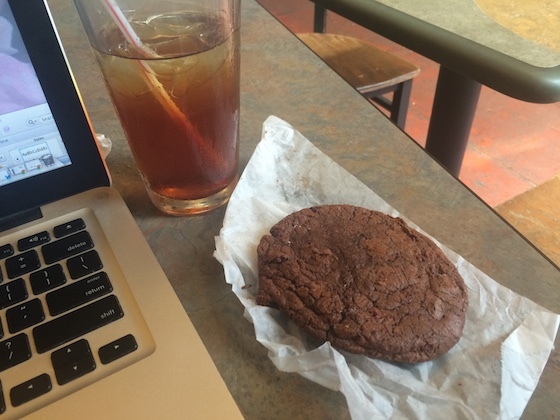 I also picked up a double chocolate cookie from The Cheeseboard, and nibbled it after about two hours of work. For dinner, I threw together a vegetarian carbonara from what was left in the fridge – it’s getting to be time for grocery shopping! 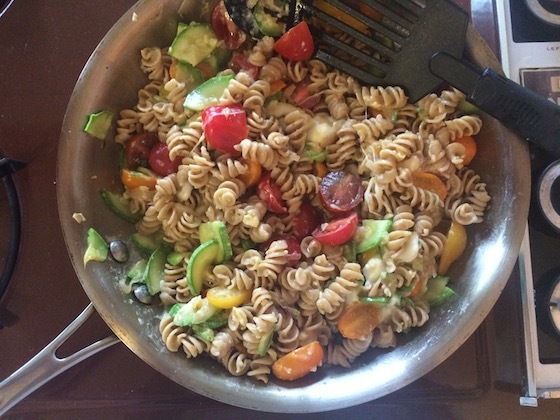 I sautéed shallots and zucchini in olive oil, then added whole wheat fusilli, halved cherry tomatoes, an egg, diced mozzarella balls, and a sprinkling of parmesan. I tossed it all together until the cheese melted and the egg formed a nice, smooth sauce. Absolutely delicious! As you can see, there were plenty of leftovers. 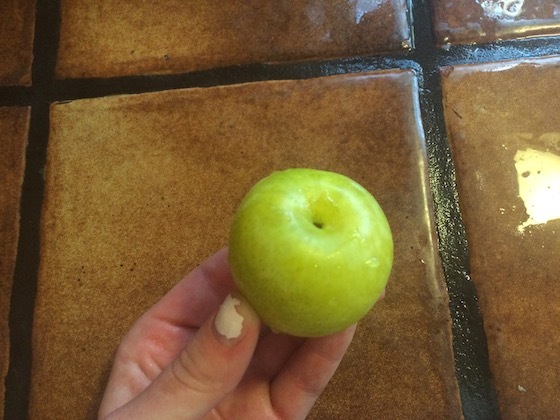 I finished off the meal with a yellow plum. Then, I curled up in bed for blog reading and TV watching. Sometimes, that’s what a girl needs on a Saturday night.